How do Christians engage with Muslims? For some Christians, there is no engagement at all. Polls have actually found a correlation between a lack of engagement with Muslims and Islamophobia among Christian Americans. Other Christians in the United States and around the world engage with Islam in an energetic way. Pope Francis is one such Christian. Since becoming Pope, Francis has been on a mission to build bridges between Christians and Muslims. He has followed in the footsteps of Saint Francis of Assisi, who emphasized Christian-Muslim fraternity during a mission to Sultan Al-Kamil 800 years ago. Egypt is a particularly important country in terms of improving relations between Christians and Muslims. Of late, Coptic Christians have faced persecution and violence, and Saint Catherine’s Monastery has been under constant threat from members of ISIS. Saint Catherine’s is also a particularly important place in terms of Christian-Muslim relations. It is in that monastery where a Covenant of Muhammad with the Christians of his time rests. In the Covenant, the prophet of Islam grants Christians freedom of religion and protection from persecution on religious grounds. Pope Francis’ approach to engaging with Muslims differs significantly from his predecessor, now Pope Emeritus Benedict XVI. Back in 2006, Pope Benedict XVI gave a controversial speech at a university in his Bavarian homeland of Regensburg, Germany. During the speech, he cited a 14th-century Christian emperor who claimed that Muhammad, the prophet of Islam, had only brought “evil and inhuman” things to the world. My own research and personal contact with Muslims directly opposes the idea that Muhammad brought “bad things” to Christians. I have highlighted how is vision for the ummah included religious pluralism and civic national principles. I have also been to over 150 mosques in the United States and Europe, and Muslims have consistently treated me with respect and compassion. Many of them have cited Muhammad as their example. It is my personal encounter with Islam and Muslim communities that has really contributed to my positive outlook on Christian-Muslim relations. Pope Francis has stressed the importance of “personal encounters” with Muslims. Unlike Pope Benedict XVI, who talked about Islam and Muslims from a far, Francis actually engages with Muslims in the physical. The Pope even shunned a bulletproof vehicle in Egypt for an open-air Mass. This display of courage is profound. 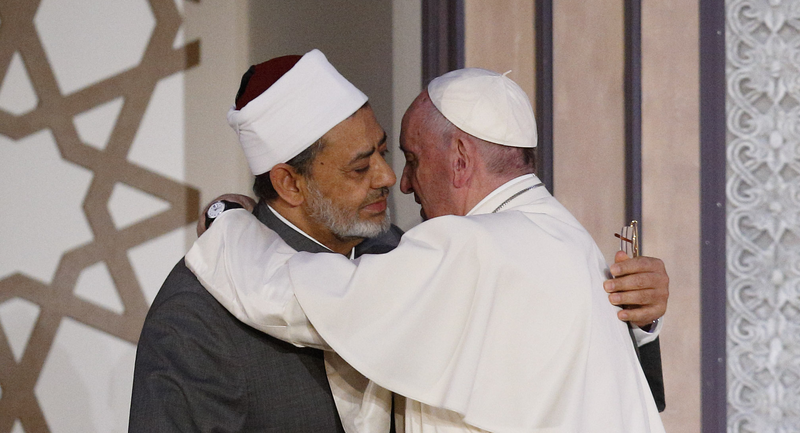 His fearless approach to interfaith dialogue is much-needed in an age riddle by fear of the Other, particularly among Christians and Muslims..
Francis’ approach to Muslims is characterized by a willingness to “cross over to the other side,” as the American Magazine reports. By this he means that Christians and Muslims need to be “peacemakers, not fomenters of conflict; firefighters not arsonists; preachers of reconciliation and not instigators of destruction,” as he noted in his speech in Cairo. I see Pope Francis as the leader of the movement that tries to end the culture of indifference among Christians towards Muslims. We should all wish him success on his bold mission. Previous Post Sapelo Island, Georgia – The First Muslim Community in the United States? Wrong. Christians are indifferent to Sikhs and Hindus. They regard Muslims with alarm or even worse. Why might that be? On the other hand how do Muslims view Christians? If they pay any attention to their holy book then not warmly. Allah tells them that Christians, along with all unbelievers, are the “vilest of creatures” and not to take Christians (and Jews) as friends for they are “friends of one another and a believer who takes them as friends is one of them”. From just a couple of the many verses in the Koran which Craig Considine never addresses.